I knew Winston Churchill was a painter, but only recently heard of his essay, Painting As A Pastime. Former President George W. Bush credited this little book with both his deliverance from “sitting on the couch, eating potato chips” in retirement and awakening in him a newfound passion for art and painting. I thought I’d read the essay online, but The Estate of Winston S. Churchill has a tight hold on the former British Prime Minister’s massive collection of writings and correspondence. I read the reviews and found this gem on Amazon.com “used” — it was actually new and I picked it up for about the price of a sugary, dairy-based corporate coffee drink. I found it to be far more substantial and learned some life lessons, to boot. 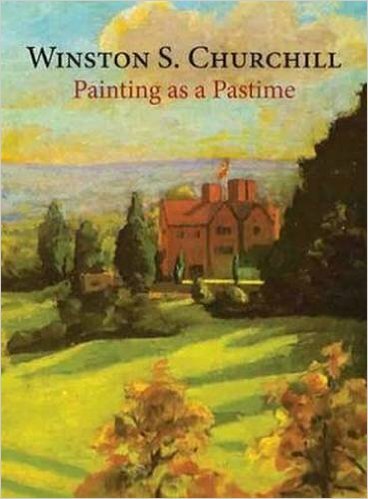 This book isn’t only about painting. I’ll fill up the rest of this post with quotes from this incredible essay that is supposedly about painting. Change is the master key. A man can wear out a particular part of his mind by continually using it, just in the same way as he can wear out the elbows of his coat. There is, however, this difference between the living cells of the brain and inanimate articles: one cannot mend the fayed elbows of a coat by rubbing the sleeves or shoulders; but the tired parts of the mind can be rested and strengthened, not merely by rest, but by using other parts. Nothing makes a man more reverent than a library… As you browse about, taking down book after book from the shelves and contemplating the vast, infinitely varied store of knowledge and wisdom which the human race has accumulated and preserved, pride, even in its most innocent forms, is chased from the heat by feelings of awe not untinged with sadness. As one surveys the mighty array of sages, saints, historians, scientists, poets, and philosophers whose treasure one will never be able to admire – still less enjoy – the brief tenure of our existence here dominates mind and spirit. What shall I do with all my books?’ was the question; and the answer, ‘Read them,’ sobered the questioner. But if you cannot read them, at any rate handle them and, as it were, fondle them. Peer into them. Let them fall open where they will. Read on from the first sentence that arrests the eye. Then turn to another. Make a voyage of discovery, taking soundings of uncharted seas. Set them back on their shelves with your own hands. Arrange them on your own plan, so that if you do not know what is in them, you at least know where they are. If they cannot be your friends, let them at any rate be your acquaintances. If they cannot enter the circle of your life, do not deny them at least a nod of recognition. One may imagine that a man who blew the trumpet for his living would be glad to play the violin for his amusement. So it is with reading in another language. To restore psychic equilibrium we should call into use those parts of the mind which direct both the eye and hand. Many men have found great advantage in practicing a handicraft for pleasure. Joinery, chemistry, book-binding, even brick-laying – if one were interested in them and skillful at them – would give a real relief to the over-tired brain. But, best of all and easiest to procure are sketching and painting in all their forms. Buy a paint-box and have a try… it would be a sad pity to shuffle or scramble along thorough one’s playtime with golf and bridge, pottering, loitering, shifting from one heel to the other, wondering what on earth to do – as perhaps is the fate of some unhappy beings — when all the while, if you only knew, there is close at hand a wonderful new world of thought and craft, a sunlit garden gleaming with light and colour of which you have the key in your waistcoat pocket. After all, if you fail, there is not much harm done. The nursery will grab what the studio has rejected. And then you can always go out and kill some animal, humiliate some rival on the links, or despoil some friend across the green table. You will not be worse off in any way. When I have had to stand up on parade, or even, I regret to say, in church, for half an hour at a time, I have always felt that the erect position is not natural to man, has only been painfully acquired, and is only with fatigue and difficulty maintained. But no one who is fond of painting finds the slightest inconvenience, as long as the interest holds, in standing to painting for three or four hours at a stretch. Splash into the turpentine, wallop into the blue and the white, frantic flourish on the palette – clean no longer—and then several large, fierce strokes and slashes of blue on the absolutely cowering canvas. Anyone could see that it could no hit back. No evil fate avenged the jaunty violence. The canvas grinned in helplessness before me. The spell was broken. The sickly inhibitions rolled away. I seized the largest brush and fell upon my victim with Berserk fury. I have never felt any awe of a canvas since. When I get to heaven I mean to spend a considerable portion of my first million years in painting, and so get to the bottom of the subject. But then I shall require a still gayer palette that I get here below. I expect orange and vermilion will be the darkest, dullest colours upon it, and beyond them there will be a whole range of wonderful new colours which will delight the celestial eye.